Spirits of the Red Sand is Australia's newest and most interactive Aboriginal live theatre and dinner experience, based between Brisbane and Gold Coast. 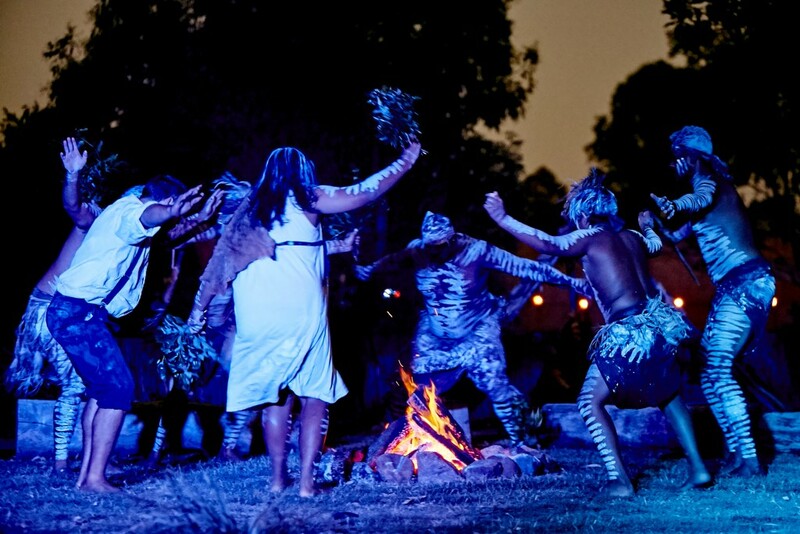 Guests journey from Dreamtime to 1800s Australia as history comes alive right before their eyes. We combine the world's oldest living culture with an historical re-enactment through 'roving' theatre sets within a 19th Century Village so all guests can leave with a powerful connection to our culture and an uplifting message of our history. Who are the people behind Spirits of the Red Sand? The Ruska Family of the Nunukul, Yuggera & Yugembah tribes who are the Indigenous owners, along with Mike Tamaki, who owns Tamaki Maori Village as well – ranked 7th best in the world by TripAdvisor. Our website launched 7Dec & with that our first booking from a Swedish couple. They still keep in touch with us, and most fondly remember meeting the kids in the show – they loved that we keep the culture alive for generations. An American mum and 12yr old daughter with grandpa in a wheelchair. I was tasked with hosting the grandpa. When we got to the third scene, the little girl was so distraught that she would miss the next set as i was 'driving' too slow. I told her to run along with the group and the grandpa and I hot-footed it to the next scene. She dined with the kids in the show. I love reading and sharing the reviews we get everyday. Guests always say they didn't know what to expect, but that they loved the experience. That it was heart warming, that they never knew the history, how the story unfolds as they walk between each set, the mingling with the cast and how authentic it is. We have the opportunity to bring Aboriginal culture to an international stage via the guests that experience us – there is so much to share – and we are humbled everyday we get to do it. It's actually a dream 20 years in the making. Mike Tamaki owns Tamaki Maori Village in New Zealand, ranked 7th best in the world by TripAdvisor and had just recently moved to Australia – his passion had always been to empower indigenous culture and bring it centre stage – not just a window dressing. The Ruska family started a dance troupe to express their culture globally in the 1990s, this led them to want a permanent location to operate from. They met Mike and started choreographing, rehearsing and creating Spirits. The ethos behind it was that we get to share our story with the world. What’s your ultimate vision for Spirits of the Red Sand? Our vision is to see anyone arriving into Brisbane or Gold Coast experience Red Sands and that it will eventually be 100% indigenous owned to empower our people, our culture and our community. A testimonial about Spirits of the Red Sand? Every aspect of the evening was first class…..It was fascinating to learn more about the aboriginal culture, excellent story telling and in the authentic village setting. A highlight of the evening was being joined by the cast at dinner, learning more about their own stories and experiences. UK.